Should You Consider a Home Theater PC? Article updated: January 29, 2012. This is the parent article of a series on Home Network and Internet Home Theater System. If you use a smart phone for more than making phone calls, then you probably qualify as tech savvy for this article. Regular TV only or with Home Theater PC? Should You Care? What Benefits for You and Your Family from an Internet Home Theater System (iHTS)? What Do You Need for Your iHTS? This article will be updated periodically and new articles added as new products and information become available to me. Regular TV only or with Home Theater PC? The convergence of media technologies (TV, telephone, Internet, and other media) has been predicted for years and has indeed been moving slowly to that end. Cable TV, telephone, and Internet service provider companies (and even search engine companies) are morphing into multimedia companies that each try to deliver all of the services from their own home turf perspective. It will be interesting to see who wins out. If you are among the great majority of people whose biggest technology leap in watching TV today is that you have a DVR from the cable company, you may be wondering why you would care for anything more than that. Certainly there is already a huge crowd out there who, like you, also watch TV shows and videos, listen to music, and communicate via Webcam on your computer. But there is still a separation between what you do with your computer and your family room TV. On top of that, whether you have an HTPC or not, the four universal remotes that came with your TV and sound system are probably already generating interesting lessons for any nearby children. So at the risk of sinking ever deeper into the realm of couch potatodom, let's explore the pretty cool capabilities you would gain from adding a Home Theater PC to create an Internet Home Theater System. And for our health, let's offset the time spent sitting in front of the iHTS by getting a sports center membership (no...you have to actually go to the center and...sweat). As a bonus I'll recommend a remote that really can reduce your friction factor. And if you're in the Piedmont Triad area of North Carolina there is a sports center where exercising is fun. Technology advances in the HTPC world have been strong, but it hasn't yet hit the mainstream. Happily we are finally at a point where taking the right steps (thus, the purpose of this article), a great many more people can set up HTPCs and the resulting market demand will trigger even more advances and a larger selection of HTPC related equipment. Let's move HTPC into the mainstream. You'll need cable TV service or, if you're lucky enough to have it in your area, FiOS (a service from Verizon that delivers fiber optic all the way to the home). CableCARD technology (more on CableCARDs below) is not available for satellite service subscribers. You'll also need broadband Internet service. We have Time Warner's faster residential service. The download speed is decent at 20Mbps, but I'm disappointed that they still have us riding a 1Mbps upload horse and buggy (still the case as of 5 Feb 2015). Fortunately, the download speed is what really matters with an iHTS as you watch high def TV and other video via the Web. Interesting—since my last speed test Time Warner's Internet speed has improved here. Now I am getting 24.84Mbps download speed, and 980Kbps upload with 25ms ping. In a separate article I'll discuss my own home network and the equipment I use to get strong wireless coverage throughout my home in addition to the Ethernet connections you'll want for your HTPC (wireless is not sufficiently reliable for it)...and other related topics. My Own Long Road: When I got started in all of this a couple of years ago I was lucky to have smart Time Warner cable techs in my area. Dennis Nahill, Robert Davis and Bill Meyers became well acquainted with the path to my home. Jason Williamson kept it going. Rob Curl from CableCARD support had to work through capricious equipment behavior. They were learning about HTPC customers in the process. It was a frustrating experience for everyone that extended for more than a year. The connection to the tuning adapter was unstable and it was difficult to isolate where to place the blame. They would come out, do some diagnostics and reboots, replacing the tuning adapter a couple of times, and at some point during each visit their magic wands would kick in to start working. It would work for a few hours, sometimes a day or two. A few times a problem with signal strength or signal noise would pop up in the area and they'd replace some component or other out on the road somewhere, and that seemed to help. Eventually, one of their magic wand wavings stuck and my system kept working for an extended period, though I still had to periodically power cycle the tuning adapter in order to receive the SDV channels. News flash! That problem may now be solved...finally! While testing the newest line of digital TV tuners, I discovered that there really has been a problem on the Time Warner end and not my equipment. Thanks to the diagnostic tools provided by SiliconDust we were able to see that, in spite of test results from Time Warner's equipment indicating all was well, there was, in fact, insufficient signal strength to Time Warner's tuning adapter. Fortunately, the amazing Barbara Jordan from Time Warner's National CableCARD Support Desk (coincidentally located here in Greensboro, NC), is very familiar with the SiliconDust diagnostic tools and system requirements and was able to zero in on this issue. Eventually an amplifier was added at my home and an exceedingly frustrating problem that has spanned almost two years has been fixed. Thank you, Barbara, and thank you SiliconDust for the great diagnostic tool. While there are many alternatives to Windows Media Center and many different flavors of those alternatives, this article will focus on using Windows Media Center (WMC). Besides being the most widely used media center (it is included in most recent editions of Windows), it is very nice. More importantly here, WMC is apparently the only media center and Windows 7/Vista are the only PC operating systems certified by CableLabs for using CableCARD-based devices. Furthermore, Ed Graczyk at Ceton pointed out that with WMC, unlike TiVo, there is no monthly service fee. I would add also that the rental fee from the cable company for a CableCARD (!$5/mo) is less than that for a set-top box. And WMC provides all the DVR features (better in my opinion) for free. Think of Windows Media Center (and the PC in which it resides) as replacing your set-top box and digital video recorder (DVR). But it goes way beyond that. In addition to giving you a much better TV guide and channel navigation tool, it also organizes access to all of your media (recorded TV, movies, videos, photos, music), offers great slideshows with optional music, and manages access to Internet TV and Netflix. Even though Windows Media Center is central to this article, it is not the focus. What Benefits for You and Your Family from an iHTS? With an iHTS you can...well...you can still watch TV. But now it's also a computer that is connected to your reasonably modern flat screen TV and has Internet access. So now you can do much more. You can watch programs and videos from the Internet on your big screen. With a Bluetooth keyboard and mouse you can sit in your recliner and surf (or even get work done) because you have a large high-def TV and the text is still clear from way back there. You'll have Microsoft Windows Media Center on the HTPC, so you will have an online TV guide that is at least twice as nice and useful (and easier to navigate) as the one you get from the cable company. Also, our young grandchildren love playing Angry Birds on the larger screen. With Windows Media Center and local or network hard disk space, you will have organized access to your full media library. So in addition to listening to your music you can watch any of your family videos on a screen that everyone can enjoy at once (not just one that is on your camera with a connection to your TV). If your HTPC has a DVD or Blu-ray drive, you can use it as your DVD player. For even more convenience, software is available that will let you copy (rip) your DVDs to disk storage where they can be perused in your Windows Media Center's movies and music listings. If you add a Windows Home Server (which I strongly recommend) to your home network, your entire media library can be centrally stored for access around your home, plus your HTPC and all other computers in your home will be automatically backed up every night. When we're not using our iHTS for something else during our family gatherings, we enjoy running a photo slide show. Mostly this serves as ambient art, but a family member will periodically catch a particular photo and start a new topic of happy family conversation...or humor depending upon the photo in question. The slide show that comes with Windows Media Center is very nice. The photos are labeled and dated (especially helpful if you use descriptive file names). I like the way WMC's slide show moves through the collection of thumbnail images and randomly zeros in to display a selected photo—a nice transition approach, putting the photos into context. Sometimes we play music softly in the background along with the slides. An HTPC gives your stereo system access to your music library, Pandora, and other sources of music from the family network and the Internet—another great benefit from having an HTPC. You can stream the music and video to other locations in the home, too. Bring up an editor or paint program and use your big TV as a whiteboard for taking notes during a family discussion. Add a webcam and your family gatherings can include remote family members. Our extended family comes together on Sunday evenings and we can include out of state families by bringing them in on a Live Messenger session. With the large TV screen and great audio from the stereo and surround sound speakers, it's like they're right there with us. Live webcam connections are currently limited to one connection at a time, so family members in different remote locations have to take turns being connected. Maybe the new GoToMeeting HD is a possible solution to this. These live webcam connections are a wonderful family benefit. It helps us to keep a relationship with the grandchildren so they don't forget us between visits. You may also get digital phone service as part of your broadband Internet package, so it can be considered part of your media convergence story. I discuss my own solution at On Digital Phone Service in the Side Topics section of this article. There are a gazillion choices and compromises that can be made based upon what you have and/or are willing to buy. Let's assume for this article that you want a reasonably decent system. I'll list some basics that are important to me and you can extend it to the limits of your budget and according to your own brand preferences. You'll notice in this article that I don't mention anything but HDMI for the audio/video cable connections. Why have more cables than you absolutely need? HDMI accomplishes this by handling high quality audio and video in a single cable that has one plug on each end. Simple. High Definition TV—with as large a flat screen TV as you can manage. Whether it's LCD or plasma, 2D or 3D, is your call but make sure it supports 1080p resolution on its HDMI port. 1080p is considered (for now at least) "full high definition." Don't worry about the quality of your TV's built-in speakers—you won't be using them. Stereo Receiver (amplifier)—it will need at least one HDMI output, one HDMI input, and surround sound. Any receiver you buy today will have this much. Beyond that lies terrabytes of articles on which brands, technologies, and features are best. It matters if you're an audiophile. Some day I would like to do a comparison of the level of friction factor of various brands in an iHTS environment. My Onkyo TX SR-604 is old now, but I like it a lot. I was especially impressed by the way you can place a microphone at the main listening spot in your room and it automatically optimizes the surround sound settings accordingly. Alternative: Get powered surround sound PC speakers to connect directly to your HTPC. Speakers like Logitech Speaker System Z906 have a built-in amplifier and multiple inputs, allowing, for example, both the HTPC and set-top box to be connected. Some support digital as well as analog input. Note: I have not personally used the Logitech Z906. I mention it as an example of what could be used. Surround Sound Speakers—I am very happy with the six speakers used with 5.1-channel surround sound. Other formats support more speakers (and more wiring). If I had the right room with the latest surround technology, I'd probably not want to go back to old 5.1. But for now I don't know what I'm missing and I am blissfully happy. Any receiver you buy today will support at least 5.1 surround. I love my Bose speakers. It amazes me what power comes out of those tiny things. You know you have a real home theater system when you can shake the walls (without distortion) while watching an action movie. Wireless speakers are available which could eliminate grief in running hidden speaker wires, but I've not used them so I do not know what friction factors would be encountered in the resulting audio quality or interference with other wireless devices. Universal Remote—to turn on/off the specifically needed system components with the press of a single button and then easily perform the common functions for those components—where easily is the reality. See my recommendation below in The Zen of Universal Remotes—At Peace With Your Remote. Tuning Adapter—if your cable company employs switched digital video (SDV). Switched digital video allows the cable company to deliver a given channel when it is needed, saving bandwidth for their systems and allowing a wider selection of channels to customers. Some cable companies have deployed SDV more widely than others. I've not been able to find current information but Ed Graczyk at Ceton reports that SDV is currently in use in less than half of the cable markets. Personally, I dislike having yet another piece of hardware and source of heat that needs another power plug and is another point of failure, so I am jealous of service areas that do not employ tuning adapters. You should also be aware that a tuning adapter can support, at most, four tuners. So if you have more than four tuners in a system that requires tuning adapters, you'll need more than one tuning adapter. Ugly. Webcam—Our TV is at the right height that I simply mounted the webcam on top with Velcro and aimed it to cover the living room for family gatherings. We have a Microsoft LiveCam HD-5000 and love it. We use Live Messenger for the free video connections. Uninterruptible Power Supply (UPS)—to provide battery power backup and surge protection for the computer. You may want to plug other components into it, too, if you get one large enough for the load. I have various models of CyberPower UPSs and have been pleased with them (look at their small business and home models). IR receiver—to plug into your PC so your remote can control Windows Media Center. One source for these is at Hauppauge's online store. Wireless stereo headset—for when you want to rock and roll with surround sound without waking the baby. 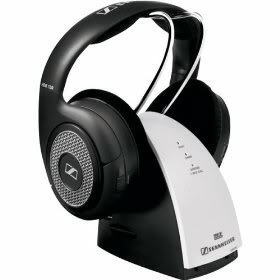 There are newer models now but mine is a Sennheiser RS130, a "circumaural wireless stereo RF headphone system, for hi-fi and TV use, and surround sound mode." I have two sets so that two people can watch a show or listen to music at at the same time without bothering others. Bluetooth wireless keyboard and mouse—get a model that will fit in the available space on or near your home entertainment center (best if right in front of the TV so you can use it standing there for short tasks). It should also be comfortable to use in your lap from your recliner. You may prefer one with a built in trackball. I use a mouse on the top of the arm rest. I have the mouse recharging cradle behind the TV so I can find it conveniently when the mouse needs to be recharged. TV tuner choice: Do you want internal TV tuners or external (USB) tuners? Internal tuner cards require a PCIe slot which means the computer will normally be larger. See TV Tuners for your HTPC. Hard disk space: It's common today to get a 1TB hard drive included in your computer, but when storing high def movies and high resolution photos, your disk space will go fast. Fortunately, disk space is pretty cheap now. I recommend Western Digital. For internal drives I get Western Digital Caviar Black from Newegg.com. WD drives last. My oldest son has a stack of failed Seagate drives. You can also add external drives for which an eSATA connection (if your HTPC has one) will give you better performance than USB. You can also centralize your media library on a storage server connected to your home network. I strongly recommend Windows Home Server. [IMPORTANT: I NO LONGER RECOMMEND WHS AFTER MANY FAILURES WITH MINE. NOW I USE A FREENAS SERVER.] You'll need 4-8GB disk space per hour of high definition recording,1-2GB per hour of standard definition recording in addition to whatever you need for photographs, music, and other media. Cabinet space and placement: Do you care if your HTPC looks like a computer or would you prefer it to look more like one of your stereo components? Does it need to be small? Extra small? Regardless, make sure it has good air circulation to avoid overheating. One option is to get a slim desktop and lay it on its side. Or you can purchase a pre-built HTPC with an attractive case from specialty vendors. A laptop is small by definition. See 6 Reasons to Use a Laptop or Netbook as an HTPC. If you really do want to build your own HTPC, specialty stores like Egghead.com sell home-built cases that looks like a stereo component. If you don't care, get a full size desktop with lots of expansion space and put it where there's room. Gaming: If you plan to do high end gaming you'll need a far more capable PC with a graphics card that will require serious cooling. So, to use it in an iHTS, you'll want to pay special attention to extra quiet fans. Whether you put an old computer back to work or select from the many available choices, the one basic requirement, since we are using digital CableCARD tuners, is that the computer must pass the Digital Cable Advisor Tool (DCAT) test. Interestingly, Microsoft does not say what the requirements are so you can ensure that you're buying a computer that will pass this test. Ceton told me that "requirements for the Digital Cable Advisor is a mystery to us as well." So Microsoft is effectively saying "We won't tell you what to buy, but after you buy it, we'll let you know if it passes." That seems ridiculous. Maybe someone will explain why they do this. As far as I can tell from Googling, I'm the only one who's even wondering about it. Fortunately, any recent vintage computer should pass DCAT. Just make sure it has an HDMI port. A CableCARD™ is a small device provided by your cable operator that, when installed into a Digital Cable Ready TV set or other device, allows you to access digital cable services without the need for a set-top box. It's about the size of a thick credit card, and fits into a special slot built into a growing number of peripheral devices, such as TVs, DVRs, and PCs. If you use a Ceton InfiniTV 4 product, with its four tuners, you will need a somewhat higher end system than the other products that have fewer tuners. In fact, Ken Plotkin at Hauppauge reports that he is running a Hauppauge DCR-2650 on a small AMD PC with no internal slots, a 1.60 GHz AMD processor, 2GB memory, and a 3.8 rating on the Windows 7 CPU scale. Ken added that "if you don't have a fast enough PC, two simultaneous programs will record fine (recording takes up very little CPU horsepower) but playback at the same time will not be smooth. People who have old, slow, PCs running Windows 7 say the video is jerky." Unfortunately, I couldn't get an answer on what is not fast enough. The three-tuner SiliconDust product requirements are akin to the Hauppauge 2650. A USB 2.0 port can theoretically handle transfer speeds totaling 480 Mbps. If you use an external USB hard drive, it will use all of the available bandwidth. So make sure it is on a separate USB port (not a shared port on a USB hub). A USB tuner will have all the bandwidth it needs on a single USB 2.0 port even if it has four tuners because a single high definition TV channel streams at just 10-15 Mbps. This, together with the high "write" speed of your hard drive (typically over 1000 Mbps for an internal drive), is why you can successfully use more than one external tuner box to get more tuners. DVD or Blu-ray optical drive—what kind of movies do you want to play that are on disk? Mozy service (2014: now I use Google Drive) to back up your data offsite (to the cloud), even locked files. This is in addition to your onsite backup solution. I strongly recommend offsite backup. A friend's home recently burned down and all data would have been lost without an offsite backup. I will publish a separate article on Mozy's service. DVD ripper software (if you want to copy your DVD collection to hard disk for convenient access by your Windows Media Center). See the article here on Copy your DVD Movies to Disk. If you are prepared to build your own HTPC or have a friend to it for you, there is no lack of advice out there. Just Google "HTPC" and most of the results will be about home built HTPCs. For this article, however, I will assume you want a pre-built HTPC. This is part of what I was referring to when I mentioned earlier that choices are limited until HTPCs hit the mainstream. The good news is that there are choices and, when it comes down to it, just about any contemporary PC could be used as an HTPC. I was going to tell you about the Dell Inspiron Zino HD Home Theater PC (HTPC). Alas, as I wrote this article Dell discontinued that model. A small, cute box, the Zino would have been easy to fit into your home entertainment center. Dell now recommends their larger looks-like-a-computer Inspiron 620/620s Desktop as an alternative to the Zino. And, as noted, many other models will also work. About Dell: I buy a lot of Dell computers; they are my preferred brand. Dell is great if you work with the right people. Otherwise they can be extraordinarily exasperating. Don't bother with the chat lines. Those who work those lines are too inexperienced to be very helpful. It's similarly hit and miss on the home sales lines. I've had significantly better luck with reps on the small business and reseller lines which is where I do most of my business. I've been mostly pleased with the quality of Dell computers. Another reason I buy from them is because computers break. If you get Dell's Gold Support you get quick access to people who know stuff. And they'll stick with you until the problem is solved—including next day onsite repair when needed. Now I could plug in a few "Dell adventure stories" but my experiences have been sufficiently good that I've stayed the course. About other vendors: I've worked with other name brands, with less success than with Dell, but I've not ventured into the small brand specialty vendor arena. I've seen a lot of good comments about two high end HTPC sources: Velocity Micro and Cannon PC. With computer hardware, the important thing to me is what happens when it breaks? And it will. Few things are more frustrating than finding out you have to cross barbed wire to get a broken product fixed. Velocity answered their phone quickly and, on this topic, told me they have excellent U.S. based tech support people. Like Dell, if someone must go onsite for a repair, they contract that to third party companies that offer service where the customer lives. Cannon PC, on the other hand, waves a big red flag to me—they have no phone number on their website. More on Velocity Micro... Their HTPC costs significantly more than a comparably configured Dell. They obviously do not turn out the volume of a Dell, but they also justify their higher cost by noting that they use high quality parts and a very nice chassis. The chassis does look like a stereo component, albeit a big one (it is full height with room for large cards and cooling systems you'll need if you push it into a high end gaming system). A minimally configured system that includesa a Ceton tuner card and Blu-ray drive is (as of now) $1829 (no sales tax outside of Virginia and free shipping). I want to try one of the cute computers like the Acer Revo 100 (available at Newegg.com). Its clock speed does not meet Ceton specs, though it may still work. It should work with the SiliconDust or Hauppauge units. I've lost hair I can't afford to lose over a variety of models of universal remotes. I finally got a Logitech Harmony (mine is the 880...2014: upgraded to Logitech Touch) and we have been thrilled with it. Logitech does it right. Sign in to their website, enter your home theater components' brands and models, plug the Harmony into the USB, and it programs it for you. Add some tweaking that Logitech customer support will do for you and life is good. On mine, push one button and it turns on all the needed home theater components and adjusts their settings as needed. For example, my TV is automatically set to the right source when I choose between viewing with Windows Media Center or the set-top box. Push another button and everything is turned off. All the common controls are right there. Whether you're watching recorded TV or a DVD or a movie stored on your computer, fast forward just works. When adjusting the volume control, it knows to do so with the receiver regardless of whether you're watching TV, a computer video, or listening to music. For some rarely used special functions you'll still need the device's remote, but the Harmony is very robust. There are personalization tweaks that I've found handy to apply to the Harmony. The process to do so is not always intuitive.The good news is that Logitech has excellent customer support. They answer the phone, they listen to what you want to accomplish, and then in short order they make the settings for you which are then downloaded into your Harmony. Impressive. If you have any Samsung components, let's save you some head scratching moments: Samsung employs a version of Consumer Electronic Control (CEC) for HDMI called Anynet. It is intended to facilitate remote control when all components are Samsung brand. But when used with a Harmony remote, both the Harmony and the devices are sending signals to other components in the home theater system. This leaves the state of each component unknown. So Anynet must be disabled on all Samsung devices. We have one phone line via Time Warner's digital phone service that I use for business. Unlike VOIP services, TW's digital phones are fax compatible. We dropped our home landline phone, but we kept the phone number and set it up as a virtual phone with Phone.com, a service I highly recommend. Using the excellent management tools in our Phone.com account, we forward calls to our "home" number to my wife's cell phone (most of the calls go to her). We also have an Xlink. It establishes a Bluetooth connection between my wife's cell phone and our home phone system whenever her cell phone is in range. This allows us to pick up calls from the extension phones around the house without having to carry around the cell phone. The cell phone just stays plugged in at a convenient place for grab-and-go. And upon returning home, it automatically reconnects with the Xlink. The business phone line from Time Warner is also connected into our home extensions, so we use a two-line phone system. The less joyful phone management tools provided by Time Warner is used to set the business line to forward to my cell phone if no answer (or it could just ring both at once). Our home phone is a Panasonic KX-TG939 series two-line Dect 6 (cordless) phone. We love Dect 6 technology, being able to take calls anywhere on our two acre lot. The audio is clear and the phone has many nice features. It also has some impressively stupid design flaws such as changing which "special" button is the mute button depending upon which line the call is on. So I keep hanging up on people when I intend to press mute. But this phone is still better than the others on the market when I last checked. I have the same but worse issues with cell phones. Why can't manufacturers just recognize when a feature is done right by someone and bring the best of all functions into one phone? I'm not talking about patent breaking stuff...just simple things like being able to turn on the speakerphone without having to worry about the angle of your jaw. I've not seen a single "basic" cellphone that has an intelligent human interface. Happily, my smartphone does a much better job with the mundane in addition to the cool. Another story. Get a home entertainment center or whatever arrangement you want to make for your components keeping in mind that you're going to have to get to them occasionally. Leave room in the back so that it's not too awful an experience to get to the back of your equipment. Then organize the myriad cables so that things are neat and accessible. You're going to have a power cord for every self-powered component. That will add up to a lot of power cords and many of them will have transformer bricks that get in the way. Some will have power plug boxes that may cover the space of two or three strip outlets. So make sure you have a surge protected power strip(s) with all the power outlets you'll need. I have two: one for the components that I want plugged into the UPS and another for those that don't go to the UPS. And I mounted them to the wall behind the theater cabinet to make them more accessible. Check periodically to make sure the surge suppressor hasn't been blown. In addition to all the power cords, you'll have at least five speaker wires going from your stereo receiver to each of the surround sound speakers. You'll have USB cables, HDMI cables, Ethernet, coax... eventually you'll check and be convinced that they propagate. So bring some control to all this. Get a package of zip-ties and create organized cable runs with a zip-tie every foot or so. Cut off the excess and don't pull 'em too tight. You'll need to cut them off periodically to get to some cable or other, so leave room to get scissors under them without cutting a cable. The cables that need to be protected against interference are probably shielded or twisted. I've not had any issues with picking up 60Hz hum from a cable running beside a power cable, but it is something to keep in mind. Consider logical cable bundles by keeping in mind which ones you may need to get to and which run in common directions. Roll up cables that are too long and zip them to keep things neat. Just make sure you leave sufficient slack for where it matters. Use the zip-ties to keep a cable in place. Channel logos: I recently discovered channel logos. Adding logos to the channel listings in the TV guide is very helpful for finding desired stations. Highly recommended. The paid version is only a few dollars and is well worth it for applying all the logos automatically to all the channels for which they are available (vs. the free version that let's you apply them manually one at a time). WMC helps you find and record the program you want: If you try to record an encrypted program but do not have an available CableCARD tuner, Windows Media Center will (behind the scene) automatically search for the same TV program on another channel or that broadcasts at an available time and mark it to record. This can be slightly irritating when it selects the show on a channel that is not high-def, but those recordings are easily deleted and you can search for that show for the next time it broadcasts on a high def channel. TV guide filtered views: The WMC TV guide has a "View Categories" option on the left. It offers options to filter the guide by most viewed, movies, HDTV, sports, kids, on demand, news, and special. You can search by title, keyword, categories, actor, director, and Internet TV. So you can filter by movies and then scan horizontally to find movies you'd like to record. The drawback is that it doesn't preserve its vertical placement but moves up and down whenever it runs into a non-movie slot. Very irritating, so I hope this is on their enhancement list. I recommend installing SpeedFan. It monitors voltages, fan speeds and temperatures in the computer. There are a lot of interesting things going on related to the topic of this article and related areas. I will periodically update this article and publish new ones.